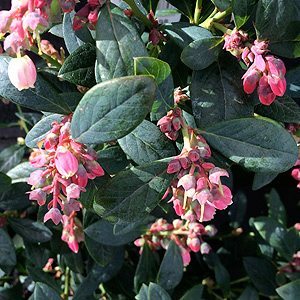 An evergreen blueberry that not only produces edible berries but is also highly ornamental when in flower during winter. Vaccinyum corymbusm is a small shrub to around 1 – 1.5m in height with a similar spread. It is self pollinating and the attractive pink flowers are followed in summer by masses of sweet blueberries. Best in full sun to a little afternoon shade, especially in the warmer climates. Like all Blueberries this evergreen variety prefers an acidic soil. Look for a soil ph or around 5-6. Good humus rich soil enhanced with well rotted compost and aged cow manure will provide strong growth. Good drainage is essential as is moisture through summer. These are bushy plants so do not require staking, in smaller areas you could grow these plants in containers using a good quality potting mix. Mulch around the plants to help retain moisture and a cool root run. Fertilize using a liquid seaweed fertilizer and a general slow release type as well. Under no circumstances use lime, and plant away from concrete paths. You will need to net plants as the berries begin to ripen to keep the birds from beating you to the berries.